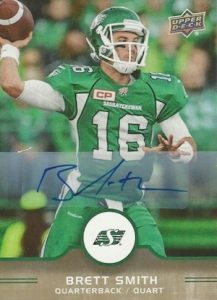 2016 Upper Deck CFL Football tackles a sport that might not have the largest fanbase or exposure but still has a dedicated group of fans and collectors. It also presents an alternative route for collecting early cards for players that eventually make the jump to the NFL or those who came from the NFL or US college football system. Each hobby box promises two jersey relics. The 163-card base set includes short-printed subsets that are broken into Defense/Special Teams and All-Stars categories. There are also High Gloss parallels of the entire base set that are numbered to just ten. Premium hits include relics and limited autographs. 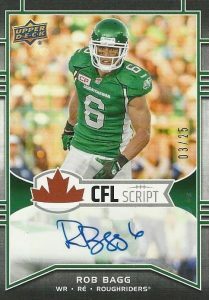 The UD Game Jersey cards average two per hobby box and cover 30 notable players in the CFL. Patch parallels are limited to 15 copies. 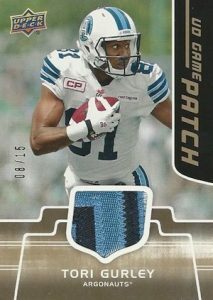 Rare autographs are found in the CFL Script insert and 12 new O-Pee-Chee Team Logo Patches offer a tough commemorative relic chase aspect at 1:128 packs. 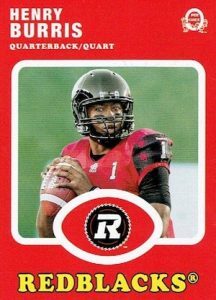 More traditional inserts close out 2016 Upper Deck CFL Football. The Retro O-Pee-Chee cards fall 1:3 packs and incorporate an old school design for current players. 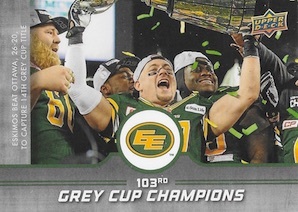 Although not easy to uncover, 2015 Grey Cup Champions inserts look back on the previous title holders, the Edmonton Eskimos. 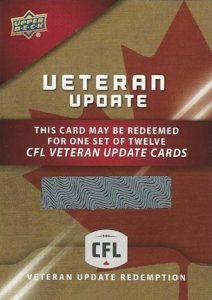 A new addition to 2016 Upper Deck CFL Football, collectors can find Rookie Redemptions (6-card set) that highlight top first-year players and Veteran Redemptions (12-card set) that feature updates for players on new teams. 163 cards. Shop for complete base sets on eBay. SP Odds: Defense/Special Teams - 1:2 packs, All-Stars - 1:6 packs. PARALLEL CARDS: High Gloss #/10. 63 cards. Specific group odds noted below. Overall Odds: Offense (#1-100) - 1:96 packs, Defense/Special Teams (#101-137) - 1:256 packs, All-Stars (#138-163) - #/25. 28 cards. Overall odds - 1:12 packs. 2 redemption cards. 1:384 packs. Looking forward to this set, I’m glad that someone has picked up the CFL after Pacific left in the 2000’s. Already have most of ’14 and ’15 collected. High Gloss but no Exclusives /100? That would have been even better! The Short Prints just ruins it for me. This product has no credibility with me…..How can you leave out John Chick the best defensive player in the league the last two years? 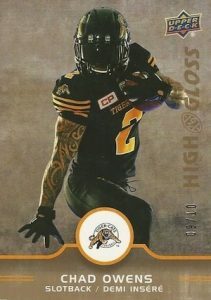 Not a huge CFL fan but there are some namesake players missing from the Hits that wouldve made this product more exciting. Chad Owens and kealoha pilares are at the top of the list for me..
Beautiful product but it’s a shame UD is SO cheap with the Auto’s and hits. At this price point there’s NO reason not to have at least 1 auto per box. Because let’s be real here, it is the CFL and it’s not like they’re too hard or expensive to obtain. I’ve opened 8 boxes, found a few interesting tidbits. – Ricky Foley (as a DE) has a card in both Defence and Offence (128 and 43). – 8 boxes and 2 cards short of a complete OPC, but 24 doubles. Also 2 cards short of the All-Stars subset (9 doubles). I was hoping I didn’t have to buy to complete the 163 card set and OPC, but I’ll have to get 4. Looking for an Update Rookie Set Redemption if anyone’s selling or knows of one!